WASHINGTON — The House intelligence committee voted unanimously Monday night to release a Democratic rebuttal to the GOP’s memo on the Russia investigation that President Donald Trump declassified last week. The Democratic document aims to counter the Republican memo, which accuses the FBI and Justice Department of abusing their authority in monitoring a onetime Trump campaign associate. Earlier Monday, Trump traded insults with the top Democrat on the intelligence panel, Rep. Adam Schiff of California. “I think it would be a mistake for anyone to suggest that the special counsel shouldn’t complete his work. I support his work. I want him to finish it. I hope he finishes it as quickly as possible,” said Republican Rep. Chris Stewart of Utah. 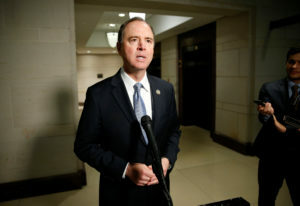 Schiff has branded the GOP memo “a political hit job” and has questioned whether House Intelligence Committee Chairman Devin Nunes, R-Calif., had coordinated with the White House in drafting the document seized on by the president to vent his grievances against the nation’s premier law enforcement agencies. The memo released Friday alleges misconduct on the part of the FBI and the Justice Department in obtaining a warrant under the Foreign Intelligence Surveillance Act to monitor former Trump campaign foreign policy adviser Carter Page and his ties to Russia. Specifically, it takes aim at the FBI’s use of information from former British spy Christopher Steele, who compiled a dossier containing allegations of ties between Trump, his associates and Russia. Republicans say a judge should have known that “political actors” were involved in allegations that led the Justice Department to believe Page might be an agent of a foreign power — an accusation he has consistently denied.